There is an exciting event in the food community coming up in Philadelphia: Eat Write Retreat. It is a three-day experience packed to the brim with opportunities for food bloggers to develop their skills in cooking, writing, and photography. Have you already made plans to attend? I know I would learn SO much from the event sponsors, the speakers, and fellow food bloggers. I’m sharing my cookie dough dip recipe in hopes that it will earn me a ticket to join the fun. Safest Choice Eggs has challenged bloggers to create a recipe using their pasteurized eggs in a cookie dough dip. 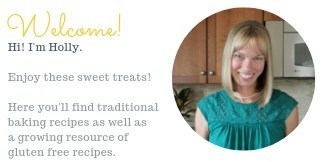 The winning recipe will be shared with the group of foodies at the Friday night Meet & Greet party. Wow! Wouldn’t that be a a thrill! I grew up in Media, PA and attended college in the area too. In fact, I’ll be in Pennsylvania the week of Eat, Write, Retreat because I have plans to attend my college reunion at Swarthmore College. I’ve hesitated to buy my conference ticket because I know it would cut into the time spent with my alumni friends on campus but I’m sure they would understand my absence if I were given this opportunity to share my recipe with the Eat, Write, Retreat group. I am ready to jump in and soak up all that Eat, Write, Retreat has to offer and I’d hope to share what I learn on my blog here in future posts. The blogging community is so quick to lend a hand and to share information and I’d love to be part of that effort. 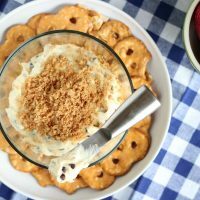 When I was brainstorming cookie dough dip ideas for this entry, my mind kept circling back to Philadephia cream cheese and cheesecake. Why not combine a Philadelphia-proud product like cream cheese with Davidson’s Safest Choice Eggs ingenious idea of pasteurized eggs in this dip? No worries about Salmonella with these special eggs which are pasteurized without the quality or nature of the egg being disturbed. It took a quick google search to confirm my hunch that plenty of people bake cheesecake cookies. Yes, indeed, the idea is not a new one for a cookie that tastes like a cheesecake and so I set out to make a cookie dough dip that looked and tasted like cheesecake. 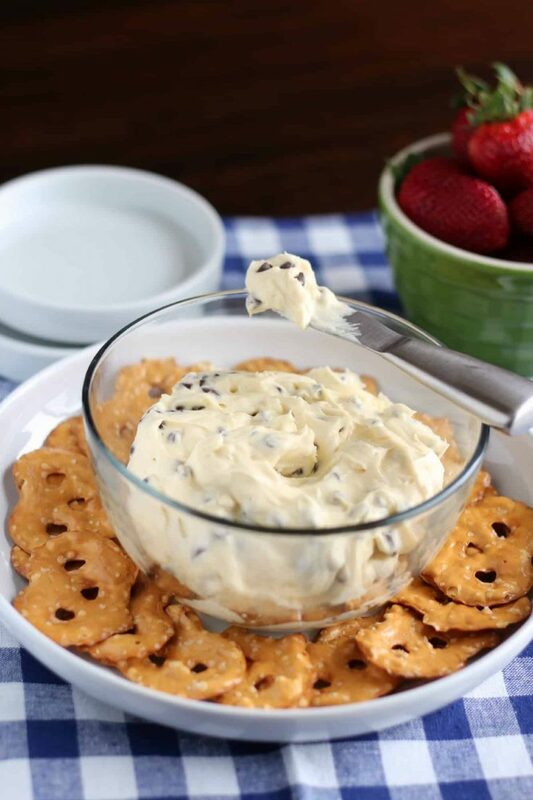 Try Original Pretzel Crisps with this Chocolate Chip Cheesecake Cookie Dough Dip or strawberries work nicely too. Chocolate Chip Cookie Dough Cheesecake Dip will be the star of the party. Creamy, sweet, and easy to make, this dip is everything you love about cheesecake but made in a matter of minutes. In a stand mixer (or with a hand-held electric mixer) combine the cream cheese, butter and sugar. Beat on medium speed until light and fluffy. Add the egg, vanilla and salt then continue to beat until well incorporated and light in color. Mix in the mini chocolate chips on low speed until well mixed throughout the dip. Refrigerate at least 30 minutes before serving. Add the optional topping right before serving. Pulse the graham crackers to make crumbs in a mini food processor. Add the butter and sugar and pulse until thoroughly combined. Sprinkle the topping over the dip. Please note that this is NOT a sponsored post. It is an entry into the contest offered by Safest Choice Eggs for a Conference-Only pass to Eat, Write, Retreat held in Philadelphia June 6-8, 2014. I presently live in Denver, CO and inquired about the rule listed that required the winning blogger to be a local Philadelphia blogger. I was informed that I could enter if I had plans to be in the Philadelphia area that week and would be able to prepare this dip for the conference attendees if I were selected as the winner. I know a lot of bloggers who really enjoy this event Holly; hope you win and attend! Where did you find the eggs? I need to try them in a recipe…I’m assuming King Sooper’s has them? Thanks in advance. Holly, You deserve to win! This looks awesome. Love your creativity and how you tied the ingredients together with the Philly theme! Wonder how this dip would taste on the “real” Philly soft pretzels???? Thanks, Steph! Philly soft pretzels, Pat’s cheesesteak and TastyKakes are on my list of food to eat when I go home to visit. We’ve even been known to pack a frozen Apollo pizza (from State Street in Media, PA) in our suitcase and by the time we land in Denver it is nearly thawed and ready for dinner. I love Philly foods! Philly. But not this year. We will see what the future brings. Good luck and have fun at the reunion! Eat lots of great Philly foods for me! Thanks for the kinds thoughts, Abbe! I’ll say hello to Philly for you this time and maybe another year we can plan ahead and go to the conference together. Mmmmm, this sounds like a winner to me Holly. Good luck! Let us know how you do. Thanks, Yvette, I didn’t win this time but it was still fun to enter. Thanks for your support! Oh this dip looks GOOD! I can see myself eating right out of the bowl with a big ole spoon! Great recipe, Holly. Pinned!